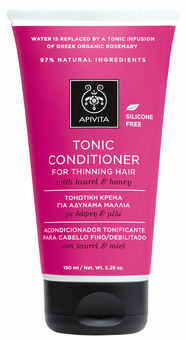 Toning and strengthening conditioner for easier-to-comb, shiny hair with volume. Greek organic thyme honey and organic laurel extract moisturize hair. Vitamins and amino acids offer shine and volume. Bio Cotton Protection System protects from the adverse effects of the environment, breakage, split ends and the damage caused by styling products. Organic lavender, laurel, neroli and sage essential oils relax mood. Ideal for cases of hair loss, pregnancy or grueling diet.